Each no gets you that much closer to a yes. Sales isn’t so much about closing every deal. It’s about playing the odds. But you don’t have to be sleazy, cheesy or deceptive about it. Trying to build relationships is the best way to approach sales, but you’ll still have to play the numbers. Not everyone is in a position, mentally or financially, to buy. Dating is similar. You have a product, yourself, that you’re looking for someone else to appreciate enough to purchase. Not everyone is in a position, mentally or emotionally, to buy. So you play the odds. In either case, it’s easy to get discouraged. Just remember, each no gets you that much closer to a yes. Well kids, so far I’m getting killed in the direct donations part. 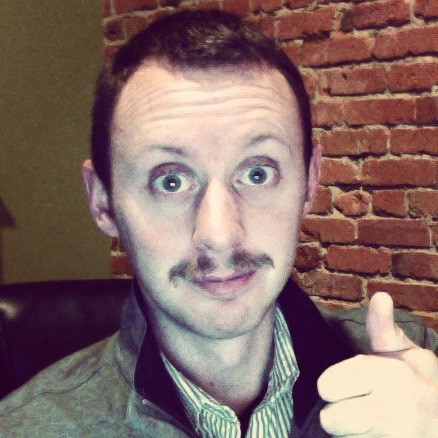 If you’d like to donate directly to my moustache, please donate here. It’s all for a great cause, as well as my self-esteem. But that’s the bad news. The good news is that Peacock Virtual Solutions‘ Like and Follower drive is going fairly well. Peacock Virtual Solutions is donating 50¢ for every new Like and Follower during Movember. If you haven’t Liked or Followed us yet, please do so! Additionally, our team has raised almost $2,000! In Spokane, we’ll be having a party to celebrate Movember on November 27th at Saranac Public House. Event details can be found here. Do you fill the space with filler words like and, um, uh, or the infamous but, um? Sometimes (maybe even most of the time) silence is just fine. Filling the silence with filler words and meaningless conversation certainly isn’t going to improve anything. Just let the quiescence hang. You’ll live. Promise. Author James Michener once said, “I’m not a very good writer, but I’m an excellent rewriter.” I’m not certain of the context, but I take this as him waxing philosophically over originality. It’s often said that Shakespeare used every emotion and plot device leaving nothing left for any other writers. The only details that change in new stories are the locations, technology, and cultures. As someone looking to start writing, it could be discouraging to approach your medium with the belief that anything worth writing has already been written. I’d like to encourage you to stay with it. Apple didn’t invent computers, they simply make them. Toyota didn’t invent cars, they just build them. The difference? Both strive to do it better than it’s been done before. Don’t let others’ accomplishments and victories keep you from achieving your own successes. Just try to be better. I wrote a blog on the Peacock Virtual Solutions site I contribute to about the new marketing skills necessary in today’s marketing landscape. The idea is simple: traditional marketing and media aren’t the same. And in order to be a successful marketer there is a new skill set required. In the end, as a marketer, you can’t sit still. If you built an empire on print media 20 years ago, odds are you’ve lost market share in the last five years. So adapt. Get better. Get smarter. Just don’t get stubborn.